Two new art installations are designed to engage with their audience. Mark Reigelman’s “The Meeting House” will rise out of the ground between Pearl and Oliver streets. Soon, visitors to Boston’s Financial District will find an incongruous Quaker meetinghouse sinking into — or maybe rising from? — the earth amid the glass towers, or they might wander into a topsy-turvy garden where people appear to grow or shrink like visitors to Alice’s Wonderland. It’s not magic, nor is it an unintended consequence of marijuana legalization. 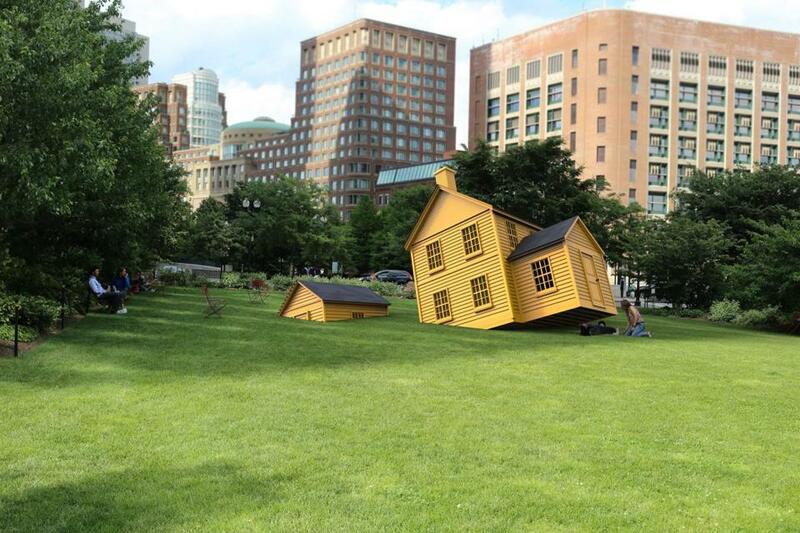 These disorienting additions to the downtown landscape are part of the latest effort by the Rose Fitzgerald Kennedy Greenway Conservancy to use public art to create public engagement. “Rather than trying to have art that is of the do-not-touch variety, a number of these pieces are really interactive,” said Jesse Brackenbury, executive director of the conservancy, which maintains and programs art and events for the Greenway. For the first time, that effort includes a unifying theme for multiple works displayed across the 1.5-mile-long strip of parkland. Each of the large-scale pieces in the Playful Perspectives series is intended to disorient the viewer, to make them question their eyes, to disrupt their routines and make the mundane seem fresh and strange. Most importantly, Brackenbury said, the pieces should be fun. The works, which will be installed over the next three months, beginning this week, include Mark Reigelman’s “The Meeting House,” a scaled-down version of the Pembroke Friends Meetinghouse in Pembroke. The structure, about 14 feet tall, will be erected between Pearl and Oliver streets at about a 20-degree angle, with space underneath where people can pretend they are the Wicked Witch of the East, crushed by Dorothy Gale’s Kansas farmhouse. The “Wizard of Oz” allusion is unintentional, Reigelman said, and became apparent to him only in a rendering he created late in the design process. “I got pretty excited, because it’s just such a wonderful American image,” he said. Another work, Meredith James’s “Far from this setting in which we now find ourselves,” will be installed in the North End parks. It uses forced perspective to create the optical illusion that people are getting shorter or taller as they move across the field of vision. “The kids really like that effect of being able to be taller than their parents,” James said. Reigelman and James’s pieces will join two existing works that play with perceptions. Mehdi Ghadyanloo’s surreal trompe l’oeil mural on the air-intake structure at Dewey Square Park, “Spaces of Hope,” depicts men and women holding small red balloons as they ascend a spiral staircase toward a giant balloon. Chris Templeman’s “Make and Take,” placed in the Greenway’s Chinatown park, includes a 3-D printer that churns out palm-size roosters in honor of the Chinese zodiac year, which visitors can keep as souvenirs. Additional works will include an installation by Aakash Nihalani, who paints fluorescent-colored three-dimensional objects on two-dimensional surfaces, creating bewildering illusions. The new art is going in despite the conservancy’s uncertain financial future. The state is poised to eliminate $2 million in annual support, about 40 percent of the organization’s budget. So far, efforts to make up that shortfall through increased support from abutting property owners, who benefit from proximity to the popular park, haven’t reached a solution. Brackenbury said state funding supports the park’s horticulture and maintenance, while private contributions pay for the art program. James’s garden is painted within an “Ames Room,” with a tilted floor and an angled back wall. From the right perspective, it appears to be an ordinary rectangular room in which people grow and shrink as they move across it. Reigelman’s structure is hand-crafted like a real Quaker meetinghouse, but in more than 20 parts that will be pieced together on-site to create the tilted building. He hopes his “Meeting House” will be a place people come together and experience bonds of community.